SEVENDUST vocalist Lajon Witherspoon recently spoke with Tigman of the Poughkeepsie, New York radio station Z93. The full conversation can be streamed below. A few excerpts follow (as transcribed by BLABBERMOUTH.NET). Lajon: "Ever since the CREED days, we've always been buddies. The timing was right – he was actually here in the States — so we were able to do it. We were always talking about it, so it's been a great time." Lajon: "I think we've all matured as artists and as writers. I would hope that, at least. [Laughs] We go in and still bang it out. I think the best songs come out when we're together as a band, and we're just jamming. Even though we all have studios in our houses and we can do different things, I really feel that, still to this day, when we're in a room together and looking at each other and doing it, that's when the best things come out." Lajon: "I was listening to everything. You name it. My father was a really big influence. He was in a disco-era band, and they had the bass, the double-kick, keyboards, guitar, a bass player and my dad was the lead singer. I remember going to soundchecks. I can remember the candles and the lighting and what the whole club looked like to this day. It was a bug in me from a kid, and my dad was definitely one of my biggest influences. It was all kind of music. When I went to the farm in Murfreesboro, Tennessee during the summer, it was country music that got played — country and rock at my granddad's barn. It was all kinds of stuff. Back at the house, it was R&B, a lot of rock too, country. I grew up listening to it all." Lajon: "That's a good question... One of Maynard's [James Keenan] side projects, like PUSCIFER or something like that. TOOL would be cool too. We did that years ago for Ozzfest, but I think it would be really cool to tour with TOOL now. That would be awesome." Lajon: "I remember that like it was yesterday... What an experience. We had a blast... We had an incredible time. For us, it was like 'Almost Famous'. We were on the side of the stage watching RED HOT CHILI PEPPERS, and then all the fires started. They ran everybody [off]. 'The artists have to leave. Get in your buses and get out of here. Duck down.' We were kids, and for us, it was like, 'This is crazy!'" 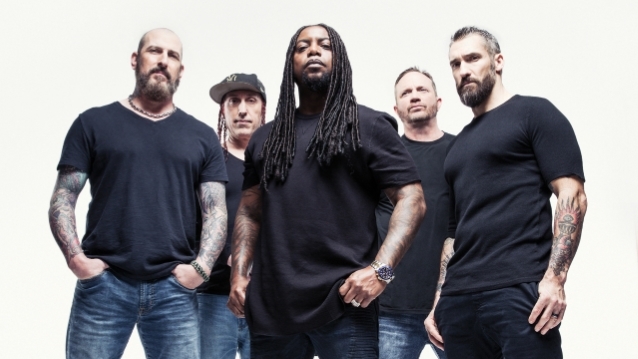 SEVENDUST's latest album, "All I See Is War", was released in May 2018. It marks the group's first album for Rise Records, the Oregon-based metal and hard rock label which was purchased by BMG in 2015.